A few weeks ago I wrote a review over the film Wake Up, Girls! - Seven Idols, the first part of the Wake Up, Girls! anime and real life idol project created to help give the Sendai region a boost as it still recovers from the 2011 earthquake and tsunami. Now it is time to look at the second part of the project, the main TV series itself. With more time to shine, does Wake Up, Girls! take center stage, or does it fumble through its new routine? One of the strongest things the entire Wake Up, Girls! project has going for it is that it gives a realistic look at the idol industry's darker side. Be it the Wake Up, Girls! having to wear humiliating swimsuits in front of lecherous men as an early gig to gain exposure, to just everything about the primary rival group, the massive idol war machine that is the I-1 Club. In the I-1 Club, the girls aren't called by their names, but instead numbers, and they can, and absolutely will, cut anyone who slips up and fails to meet the stifling standards of the I-1 Club's manager even just once. This same manager essentially has the I-1 Club functioning as an army, complete with the idols getting into perfect rank and file whenever he enters the room and routinely makes them repeat a dehumanizing mantra. It has been three years since the disaster that devastated Japan's Tohoku region, and yet Wake Up, Girls! is one of the first, if not the first, shows to even approach the topic of the event. And thankfully it doesn't make light of the event and the aftermath, but is rather respectful and solemn about it. 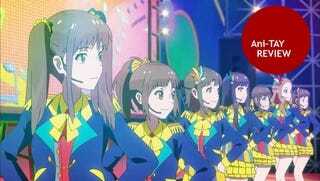 The songs that the Wake Up, Girls! get to sing in this show are pretty catchy, if I may say so. Granted they aren't collectively the best singers out there, but that is kind of the entire point of all of this, really. Yoshino "Yoppi" Nanase and Kaya Kikuma, Wake Up, Girls! 's leader and second-in-command respectively, are far and away the two strongest characters in this show. They are the most levelheaded and mature of the bunch, and go through amazing character arcs. It was a real treat to get to see these two characters develop into fully realized characters after the film's dearth of character development. One of the nicest surprises in Wake Up, Girls! is the group's small, but dedicated group of fanboys. While they may be otaku when you get right down to it, and thus can be a little odd and standoffish, their dedication to the group has a certain charm to it. In a way they are stand ins for the viewers, in particular the fans of the show itself. At least in regards to fanservice. You see episode 2 is one of the strongest, and at the same time one of the most difficult to watch, episodes in the series, primarily because the first half of the episode shines a nice negative light on fanservice. We, the audience, are powerless while we see the girls being ogled and even groped by the creepy bastards they have to perform in front of while wearing skimpy swimsuits. It is a nice commentary on fanservice and something I praise the series for. I then slightly retract that praise because the very next episode they have straight forward fanservice by having some of the girls appear on TV in swimsuits. It sends mixed signals by saying fanservice is both bad and good. During the course of both the film and the show one of the central plot points is why the character Mayu left the I-1 Club where she was the Club's leader before they made it big. It is a highly built up revelation, as harboring her secret greatly disrupts Wake Up, Girls! 's dynamics. When it is finally revealed, it is rather underwhelming. It is still a pretty big deal, to be sure. However it is utterly overshadowed by the tragedy Kaya had to bear, and considering both Kaya's tragic past and Mayu's secret are revealed in the same episode, with Mayu's after Kaya's, it just seems so small and insignificant in comparison. Much like the film, the longer the series goes on, the weaker the animation gets. While it is completely understandable considering budget constraints, and the director of the film and show himself had to take to Twitter to call for additional animators to work on the show, it still is a flaw the show has. Many of the later episodes have amazingly bad proportions, facial features are misaligned, transitions and any kind of movement are stiff and janky, just all in all the animation is really low quality. At the very least it never got as bad as episode 11 of Wizard Barristers, which was damn near a literal slideshow. So it may be bad, but it could have been so much worse in hindsight. Wake Up, Girls! 's talent agency, Green Leaves Entertainment, is ran by two of the dumbest characters I have ever seen. Like it was pretty clear as day why the agency was close to going under at the start of the film with all of their talent leaving them. They constantly make poor business decisions throughout the course of the series. It is only by sheer luck that some of their boneheaded moves ended up working out in the end. Despite its flaws, Wake Up, Girls! is an overall well written experience that stands out from the crowd in the idol anime genre. It respectfully approaches a subject that few still want to touch, sheds light on the dark side of a rather exploitative industry, and it has some amazing characters in the seven girls that make up the titular idol group with Kaya and Yoppi in particular being stand out characters. Needless to say, Wake Up, Girls! is one of the biggest positive surprises of the season for me, and one that I highly recommend. Especially with reports that the animation on the Blu-rays and DVDs are much improved over what aired.